Is there a better alternative to FilesInymCM? Is FilesInymCM really the best app in Contextual Menus category? Will FilesInymCM work good on macOS 10.13.4? 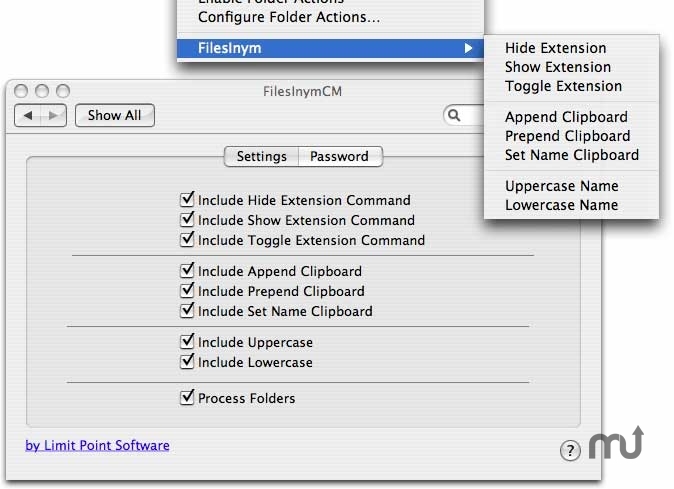 Appending, prepending or renaming selected files in the Finder with the contents of the clipboard. Changing the character case of the selected files in the Finder. These operations can be applied to a folder's contents or the folder itself. Use the system preference pane to specify your preference. FilesInymCM needs a rating. Be the first to rate this app and get the discussion started! FilesInymCM is part of the Limit Point Software "Utilities Bundle." Visit the Utilities home page at: http://www.limit-point.com/Utilities.html for a list of all the software available. Updates are always free, and new products always included. The contextual menu has been ported to Snow Leopard. All functionality has been implemented as a service application. Install FilesinymCMService in your Applications folder, optionally adding it to your Login Items for your account. When selected in Services Preferences you will see the menu items "Hide Extension," "Show Extension," "Toggle Extension," "Append Clipboard," "Prepend Clipboard," "Set Name Clipboard," "Uppercase Name," "Lowercase Name," and "Capitalize Name" when a selection is made in the Finder. It will appear as a menu items in the Finder's Services menu, and as a menu items in the Finder's contextual menu "Services" submenu. The System Preference pane, for entering permanent passwords, has been upgraded to 64-bit so that the System Preferences does not need to re-launch in 32 bit mode to load it.